Lawn maintenance can be a lot of work without the help of a professional lawn service. A lush lawn and a well-maintained garden can certainly attract many compliments, while also increasing the value and aesthetics of your property. In order to keep your lawn looking vibrant and green, it must be cared for with proper landscape maintenance. The experts at Blooms Landcare in Fort Worth, TX are dedicated to assisting our customers in keeping their landscape in pristine condition. Aerating the soil around the root system of trees and shrubs so the plant receives more water directly to the roots. This allows the roots to spread more quickly. Applying liquid fertilizers directly to each plant to ensure strong roots and vibrant blooms. Proper pruning, which is incredibly beneficial to the health of the plant. Changing irrigation nozzles to ensure equal hydration and prevent overwatering. Treating plants with organic pesticides to help plants and your family stay healthy. Mulching, which allows the soil around the plant to retain more moisture. 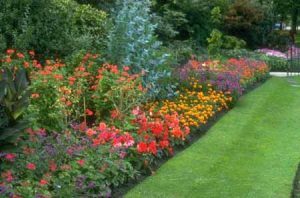 Dead-heading, removing spent foliage, pulling voluntary growth, and maintaining your garden. Our friendly landscaping professionals have a commitment to quality landscape maintenance and excellent customer service. Feel free to call Blooms Landcare at (817) 688-5352 or contact us online.